Hi guys, I’m Carla from The Pretty Dish and I’m so excited to be guest posting on Fashionista NY Girl today! Since I’m currently seven months pregnant, I’m here to here to share a few things I’ve learned about making a wardrobe work during the roller coaster that is pregnancy. 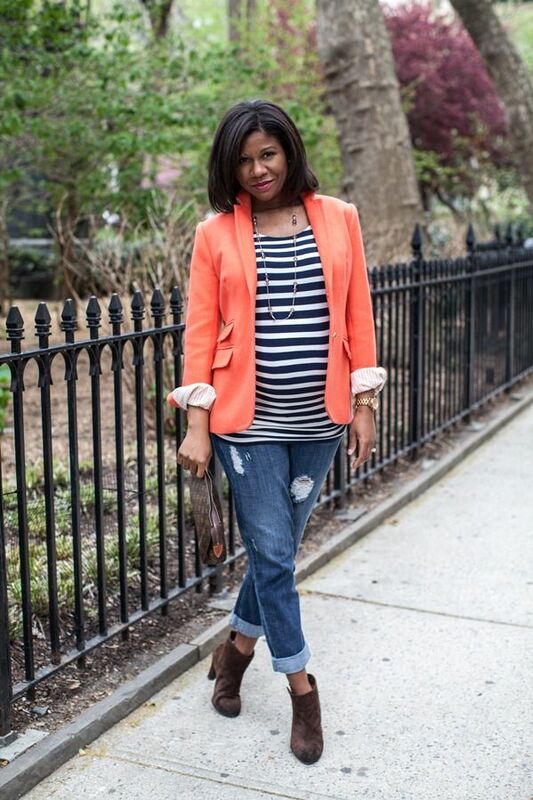 Fashion and style don’t need to totally take a back seat just because you’re pregnant! Gone are the days when our only options were unflattering tent-like garbs that made expectant ladies look even bigger. Though comfort is definitely key during pregnancy, more brands than ever are making maternity wear that feels and looks good. Beyond this, you’ll be surprised that by experimenting with your non-maternity clothes, you’ll find several pieces that work well into pregnancy…especially given the looser styles that are on trend right now. The collage above features a few of my favorite maternity brands (and one brand that’s pregger-friendly but NOT maternity), and my picks for great pieces that should work really well for a maternity wardrobe. 1. 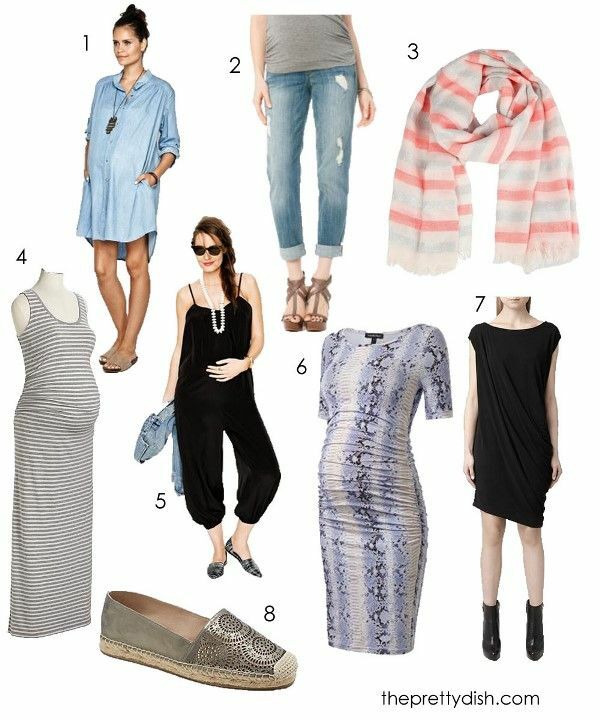 This Emily Tunic by Imanimo is super on trend (hello chambray) and the casual vibe makes it super versatile. 2. These SOLD Design Lab Jeans are what I like to call “pregnancy perfect.” Amazingly comfortable, they’re just as cool as any jeans you’d rock outside of pregger time. 3. Drapey scarves like this one by Shawlsmith London are a great way to go during pregnancy. By adding one to a basic black dress or a simple white tee with jeans, you’re essentially dressing the bump. 4. Please, PLEASE invest in one, two, SEVERAL maxi dresses. You won’t regret it. My favorite is this one, by Old Navy. I have three of them – one in navy, one in black and the gray striped one that’s pictured. They’re so comfortable and the fit is flattering – hugs in all the right places. 5. Hatch is hands down, one of the coolest maternity brands out there. Check out this adorable jumper that can easily be dressed up or down. 6. Isabella Oliver is another brand serving up serious fashion for those of us who are expecting. The great thing about this snake print dress (if you dare to wear something so form-fitting) is that it’s designed to work when you’re not pregnant, too. 7. All Saints is one of those brands offering drapey items that work well into pregnancy. Consider this sleek black dress. It would look super cute even if you’re on bump watch. 8. Confession: I’m not one of those people that thinks one should steer clear of heels during pregnancy. However – pairs of comfortable flats are important, too! I love these Vince Camuto slip-ons…wearing them with the cuffed jeans pictured, or the chambray dress, for that matter, would look super effortless.